Over the last few months, information on the Samsung Galaxy S IV has been sporadic and varied. But today, just a week and a half out of Samsung's much anticipated unveil, we're getting some morsels of information from a source that's been reliable in the past. 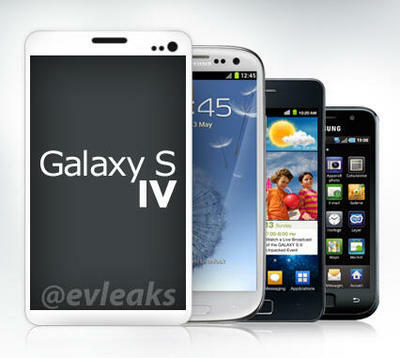 Here's what these alleged Galaxy S IV pictures tell us: it'll have minimal bezel, no home button, and edge more toward the Galaxy Note in size than the Galaxy S III. These mockups may not indicate a final product whatsoever, but they convey just how much Samsung's most popular family has evolved over the past several years. Bigger, bigger, bigger. But also an improved feeling of premium quality, an attempt to make the Android platform all its own—the plan has worked so inimitably that Google may be worried Samsung is growing too big. This isn't a full-on spec unveil, but big bullet point information is here: Super AMOLED Full HD display, 13-megapixel camera, Android 4.2, 16GB/32GB/64GB and 2GB of RAM. Nothing incredibly revealing, but all the information, like the supposed eye-tracking tech we heard about earlier today, is starting to paint a clearer picture. March 14 seems so close, yet so far. As we get closer to that date, our excitement level is going up that much more. We can't wait to see the device revealed first-hand.